2015 edition of Tenerife Bus & Touring Map including Bono-Via and timetable information. Including the latest updated Tenerife Map at 1:100k scale along with updated large scale street plans for Las America/Los Cristianos, Santa Cruz, Puerto de la Cruz, Los Gigantes/Puerto Santiago/Playa la Arena, Golf del Sur/Amarilla Golf, Las Galletas/Costa del Silencio. Details of the Transvia 'must ride' Tram experience from Santa Cruz to La Laguna and return - known locally as the 'Tren'. This is a fully detailed up-to-date map of Tenerife designed for bus users and car drivers. Masses of Titsa bus routes and timetable information including the Bono-Via discount bus tickets used on Titsa buses; saving up to 50% on the already pocket-money fares. Tenerife island has been drawn at a scale of 1:100,000 with particular emphasis on navigation by road and Titsa bus routes. 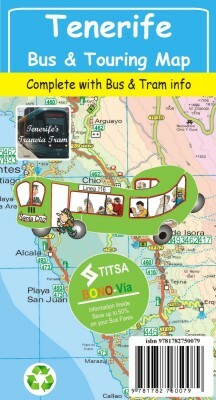 Since our 2012 edition Titsa has ‘reorganised’ their routes and timetables with a whole heap of changes so make sure you are using the latest edition of Tenerife Bus & Touring Map. Extensive place name index makes finding your destination on the island quick and easy, while our bus terminus and bus route numbering helps you find the routes you need to go where you want to go. Tenerife Bus & Touring Map is your best choice for exploring the stunning landscapes of the Island of Eternal Spring and is the travel essential for everyone visiting this exciting island in the Canaries. 860mm by 660mm makes Tenerife Bus & Touring Map a big map but thanks to our specialist ‘concertina map fold’ it is easy to open, and more importantly easy to refold to its convenient pocket size. 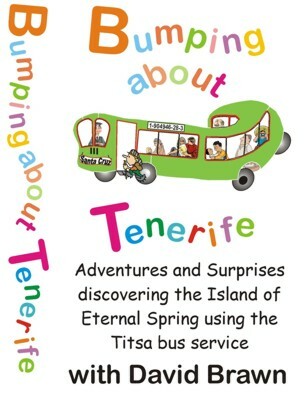 'Bumping About Tenerife' on Amazon Kindle, will give you a taste for the style of adventures and ‘rattling’ good value you can enjoy exploring Tenerife on the Titsa bus service. Home, Titles, Digital Cartography DWG Ltd.